Of the thousands of aircraft we track each day, many do not yet have an ADS-B transponder and still rely on an older transponder to report flight information. For these aircraft we’ve developed our receivers and software to take advantage of Multilateration (MLAT) to help us track their flights. We developed MLAT in an effort to track additional flights, but also because it’s an exciting technique and we saw it as a good technical challenge. For our purposes, MLAT requires four or more receivers in a region to receive a signal from the same aircraft. We then measure the Time Difference of Arrival (TDOA)—or the time it takes the signal from the aircraft to reach the receiver. By comparing how long it takes the signal from the aircraft to reach each of our receivers we are able to determine the aircraft’s position and speed. MLAT position accuracy is near that of ADS-B. Through our testing we have achieved accuracy to within 10-20 meters. Speed is also calculated when tracking with MLAT, but errors are common in speed data, especially when an aircraft is circling or making turns. Most parts of Europe and North America are today covered with MLAT above about 5,000-10,000 feet (1,500-3,000 meters). There is also some MLAT coverage in Mexico, Brazil, South Africa, Japan, Taiwan, Thailand, Malaysia, Indonesia, Australia and New Zealand. We are currently expanding MLAT coverage in South Africa, Colombia, Venezuela, Ecuador, China, South Korea, and Japan. We’re also making steady progress in Russia. In some locations we have been able to achieve MLAT coverage below 1500 feet (450 meters), including Amsterdam, Stockholm, Toulouse, Reykjavik, and most recently, Chicago. Previously, processing the received MLAT data resulted in a small delay in the display of aircraft positions of approximately 20-30 seconds, but we have recently been able to eliminate this delay for most flights. An issue that mainly affects MLAT flights outside of Europe is missing callsign information, which makes it very difficult for us to match the correct route information for flights. Route information is not transmitted by the aircraft, so we must compare the callsign with flight and schedule databases to determine and display the route. When tracking via MLAT we may not receive the callsign, and therefore have difficulty determining the route information. Aircraft speed is also a consideration when tracking flights with MLAT. The speed of an MLAT flight is calculated based on how long it took to fly between two calculated points. MLAT position calculations have a general accuracy of 10-100 meters and 1000 meters in the worst cases. If both calculated positions are incorrect, then the speed we calculate is incorrect, which can lead to a single-engine prop plane nearing the speed of sound. 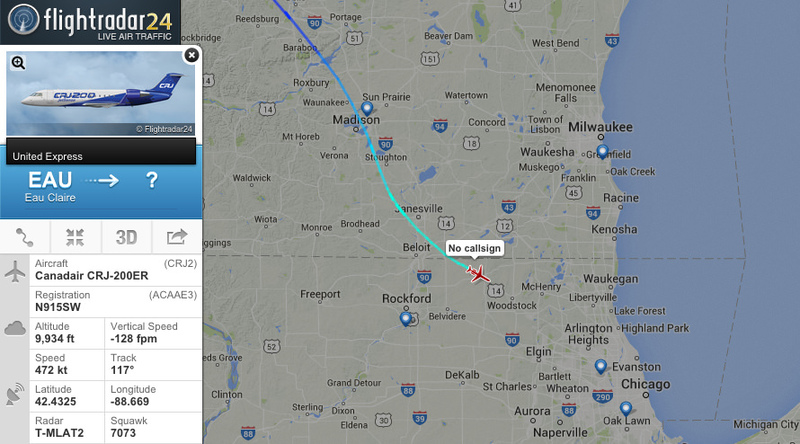 A flight tracked with MLAT with a missing callsign makes it difficult to match route information. However, our main limitation with MLAT tracking is aircraft altitude. The lowest altitude in most locations at which four receivers can reasonably receive a signal from the same aircraft is between 5,000-10,000 feet. Below that altitude, the probability that four receivers can obtain a signal from an aircraft decreases. When data from an aircraft is no longer being obtained by four receivers, the flight is not displayed on the map. We’re often asked why a particular flight has “disappeared” from the map. In many cases the answer is that the flight was being tracked with MLAT and the flight descended below our coverage altitude at that particular location. It’s important to note that these flights have not “dropped off radar.” Air traffic controllers maintain contact with these flights even when we lose our ability to track them with MLAT. We are currently working on improving MLAT tracking and we will soon be able to continue calculating aircraft positions using only 3 receivers. Adding new receivers to our network also helps us improve MLAT coverage. Additional receivers bring MLAT coverage to new locations and allow us to track aircraft at lower altitudes in areas with existing MLAT coverage. If you’re interested in hosting a receiving and helping us increase coverage, please apply today.